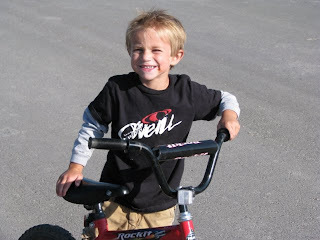 Jake decided it was time to take off the training wheels. He did it the first time I was pretty nervous he was going to fall but he just kept on going. Now he won't stay off his bike. 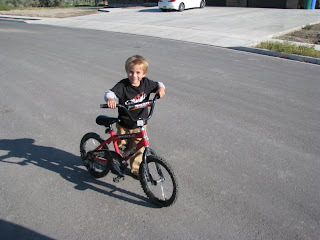 How cute is he on that bike! He looks way to little to be riding all by himself! How funny we were just talking about that. 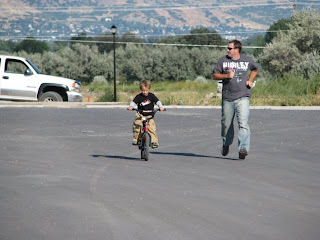 I am not suprised though, jake is the most coordinated kid ever. Isn't it crazy how when they decide to do it, they just do it. The pictures are so cute. Yeah!!! how fun is this, and Max is getting excersice too. Yea jake you stud muffin we new you could do it!!! I seriously cant believe him on that bike! I like that picture with Max running its pretty funny.